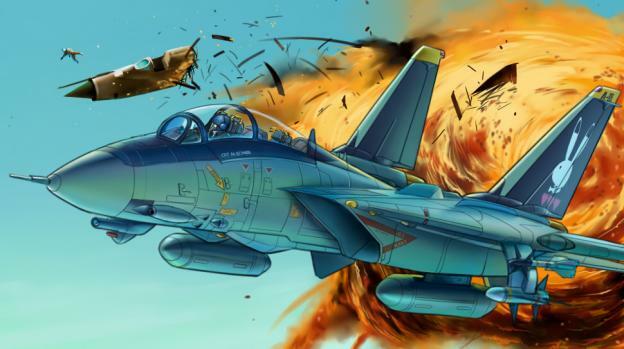 i decided to go with an F-14 Tomcat, painted in the colors of Mickey Simon's F-14 from the Anime/comic Area 88.
the kit im gonna be using is a Revell 1/144 F-14A Tomcat, decals for the tail will be used from an older F-14A Black Tomcat kit. i barely started, all i did was cut the tails out of the spreu and applied a first layer of black paint. it wont be done anywhere before newyears, with the holidays coming up, and im spending christmas at my GF's place, i wont have any time to make significant progress. meanwhile, i built the rear fuselage, but i decided, to keep things simple, to glue the wings in a fixed position. some more progress made today, almost ready for the paintshop. i still need to scavenge the stash for 4 additional AIM-7 Sparrow missiles. almost done, the main paintwork is finished, all that needs to be fitted and painted is the landing gear, weapons and engine nozzles. ive found a pait of aditional AIM-7 Sparrows in the sparesbox, thinking the AIM-54 Phoenix is a bit overkill for mercenaries on a tight budget. besides, ive never seen Phoenix Missiles in Area 88. Looks like its shaping up nicely. As for drop tanks, I would add them only because I like fully occupied hard points, but if you're gong for a cash strapped mercenary look, then I would go for a light AA load only..
Actually speaking of drop tanks, I just re-watched episode 3 and noticed a funny production error. Shin is in an unloaded phantom and Mickey is in his tomcat, neither one has drop tanks, then in the next scene the tomcat has drop tanks, the scene after that Mickeys drop tanks appear on Shins phantom, which he then jettisons. Also as Mickey flies away you can see a single fuel tank in the middle, so you might want to consider that.